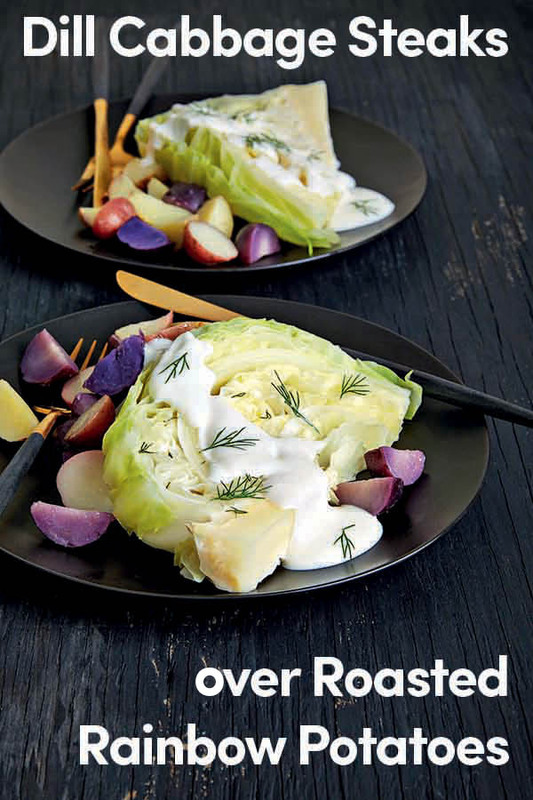 This easy recipe for Dill Cabbage Steaks over beautiful and hearty Roasted Rainbow Potatoes is a healthy, satisfying meal. This ridiculously easy recipe is sure to be a hit any weeknight dinner. I have to admit that I was skeptical about cabbage steaks, but once I tried them I was hooked. This takes very little effort and makes the perfect stick to your ribs meal. You can double the potatoes if you're extra hungry. Slice 4 cabbage steaks from the thickest part of the cabbage. Coat sides with 1 tablespoon (15 ml) olive oil, if using. Toss the potatoes in 1 tablespoon oil (if using). Store in the fridge overnight. Either oil your crock* or line with parchment paper. 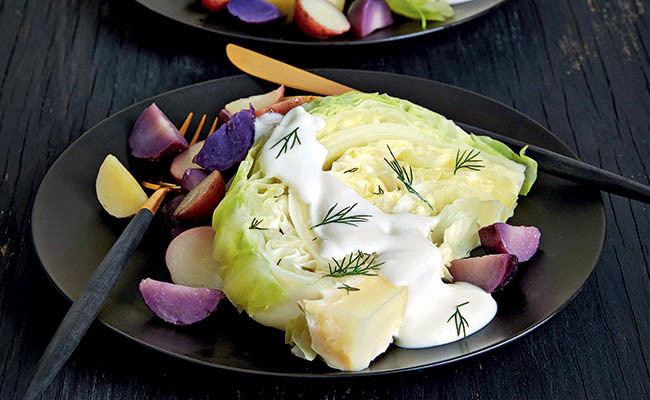 Spread the potatoes out and layer cabbage steaks on top. Sprinkle dill and yogurt over the steaks. Cook on low 7 to 9 hours. Okay - now I'm really hungry...!!!!! Love steamed cabbage,, just love it,, soooooo good for you.. - No potatoes for me though..